We’ve reached peak attention on the internet. 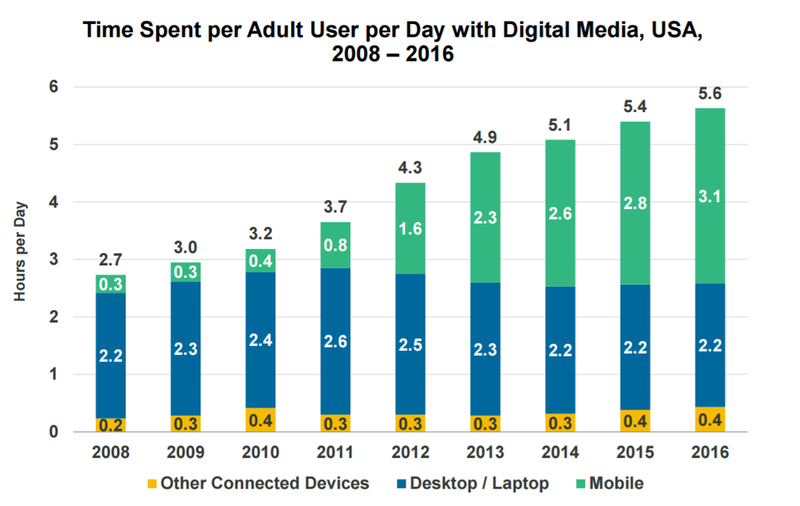 As you can see from the graph below, the time spent online is not significantly growing anymore. The growth of the internet has generated 4 champions (Google, Apple, Facebook & Amazon) who together dominate for the most part how you spent your time online, where you do your shopping and how you get online. 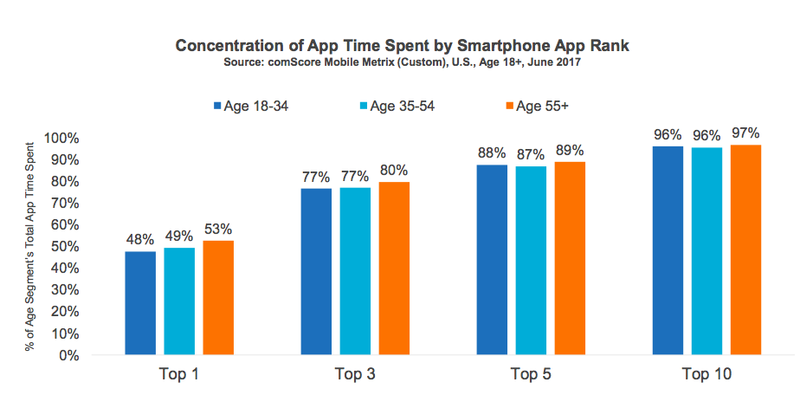 Comscore’s Mobile App Report 2017 underlines this, they found that most of all our time we spent only on 10 apps. These companies are now at their peak and they have the momentum to buy, absorb or change their tactics to fend off any competitor. The Facecbook / Snapchat battle is a great example of that. Facebook just absorbs everything which makes Snapchat unique. 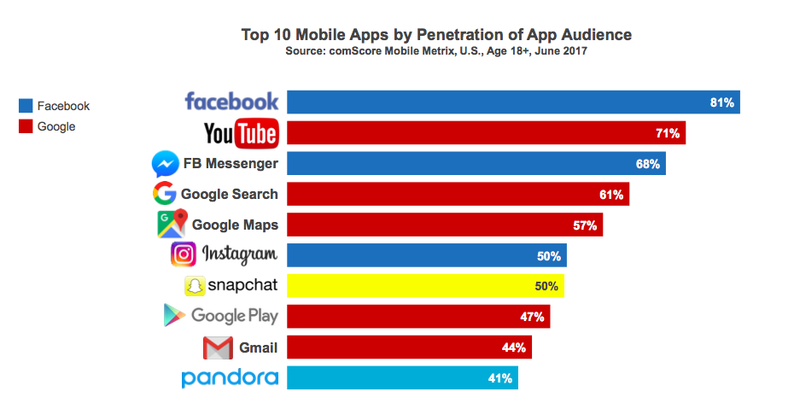 It might not capture all the audience away from Snapchat, but just enough to defend their position. VCs love to say that it became much cheaper to start a company and in many ways this still holds true today. Except it became more expensive and harder to distribute your product – being it a service, software or product – and reach your audience. It is more expensive because today you need a website and 2 mobile apps instead of just a website. Harder because by default you don’t have easy access to your audience anymore. The audience does not live on the web anymore. They live in Facebook, app stores, search engines, Amazon and Netflix. The attention of the average internet user is fully engaged and it has become virtually impossible to steal a bit of that attention away without smart, engaging and costly marketing. You used to be able to start a company by building a site and service and launching it. You could market it to a few key users and find a few journalists to write about it. Today that is not enough, you get quickly buried because we reached peak attention. I would argue that it is much cheaper to scale your company nowadays – not necessarily to start one. I don’t expect that AI, machine learning, AR or VR will not significantly change the landscape. GAFA is well situated to absorb and embrace those new technologies. They’ll lead to new opportunities but companies need to battle the same attention problem like any other company launching a new product or service on the internet. It’s reasonable to assume that only a major new platform or major platform shift can threaten their position and generate a new set of GAFA companies.